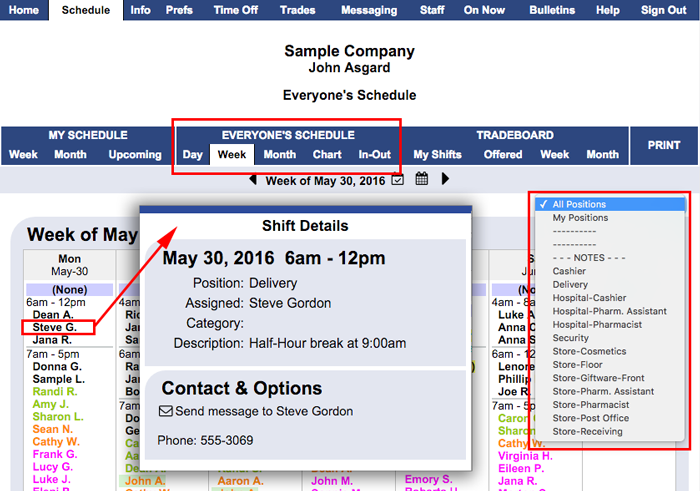 If your manager allows staff to see Everyone's Schedule, you will see that option on your home page (and also on your My Schedule page). The complete schedule for everyone can viewed in four different layouts: Day, Week, Month, Chart, and In-Out. Note: This view defaults to only show the positions that you are set to be able to work. To view all shifts, be sure to choose All Positions in the Display dropdown menu on the right. This view is especially helpful if workers have more than one shift per day. It shows you start and end time for each day. Depending on how your manager has set it up, you may see one week at a time or up to a month at a time on this new view. Clicking any shift brings up the Shift Details window where you can get more information about the shift and who is working it. (Each worker can set whether they want their phone number and email address to be viewable by other workers on their Info page. Some workers' information may not be viewable for this reason). If the shift is for a position you can work, you will see a Propose a Trade link.